A Lovely Cabin House with Two Master Suites. A Stay to remember and enjoy time and time again. Please Note: There is one main house with two master suites. I book the entire house or the master suites separately. The cost for the entire house is about twice the price of renting the master suite only. There is an adjacent guest quarters about 100 feet away that a friend occupies but is rarely seen. He is a gentleman in his 70s whole stays inside most of the time. The main cabin house is completely separate and private from the guest quarters. I occasionally occupy the music studio, which is a converted 1/2 garage in the lower level of the house in order to do routine maintenance or work on various projects on the property. Also, it helps to be near just incase guests require anything or have questions and/or want assistance in or around the house. I never disturb my guests as they occupy the cabin in its entirety and have complete privacy. As it is: A stay to remember and a place to enjoy time and time again. toilet, shower, This bathroom is complete with a double shower. The Wood Burning Stove is the best and most efficient source of heat. There is plenty of wood to enjoy a crackling fire. Push dampers in all the way for hottest burn. Use portable heaters sparingly. Available when needed. Ask Owner. There’s room for only two vehicles. There is a park-n-ride at the corner of Foresthill Road and Happy Pines Drive. 1/4 mile from the property. Look for the Fire Station and Todd Valley Estates. All WIFI information provided in house. Although there is a dishwasher, I prefer my guests to simply put dishes in. No need to start it. Help yourself to whatever is in the Kitchen. You may leave food and drinks if you'd like as well. Coffee, tea, sugar and cream provided. Plates, Utensils, Cups, Cooking supplies. Salt, pepper and most seasoning. Plates, bowls, cups, glasses, wine, coffee and tea. Forks, spoons, knives and BBQ items. Full kitchen and all appliances are included: refrigerator, LP gas stove top and oven, mini toaster/oven, toaster, microwave, blender, utensils, pots, pans, can opener and wine/bottle opener. Local channels available. There are DVD movies in the drawers and an Aux in coming from the stereo with a mini jack cable to connect your portable device. Takes two/three times to power on TV. Local channels available. Set remote input to TV. It takes two times to power on the TV with remote. Please do not adjust the settings other than from DVD to Aux. Do this AFTER plugging in your device. Thank you! Mini pool table is found in entertainment cabinet in drawer. The hot tub is located near the back patio behind the seating area. DO NOT adjust the settings. Simply push “timed jets” only. Thank you to Seth for our nice stay. The heater was turned on for our arrival Friday night, and the house was very neat and clean. There were ample supplies for bathroom amenities and a fully stocked kitchen for cooking needs. The bedroom was comfortable and although it's heated by an electric stove, it was quite toasty and warm. The hot tub cover needs to be updated but it's a good size hot tub for use. Overall, it was a place for a quick getaway. I'd recommend staying here again. Advertisement needs to be changed. Beautiful but NOT private & secluded like it claims. The main complaint that needs to be addressed on the advertisement is that the renter is not actually getting the "entire house" & it's not that private. I emailed the owner prior to making payment on the place to confirm that indeed we would have the "entire house" to ourselves & that he lived in a different house on the property and may be out working on the property at times. Otherwise, it was completely private. WRONG! The garage is actually totally off limits to guests because it's used as a studio for the owner's friend's to "couch surf". Upon arrival, we were met with the owner and his friend who was "couch surfing". It was unclear if she was actually staying in the garage or if they just had the garage door open for something else. After hearing voices through the walls & noticing her car was still in the driveway, I wrote the owner asking if she was staying in there. Without a direct answer, he said he would address our privacy and noise concerns immediately. This issue was not addressed. Both nights we could hear loud snores through the floor while we were in bed. The next afternoon, the "couch surfer" from the garage came and knocked on our door because she wanted to get a bottle of wine from inside the house. A few hours later, a man and his dog arrived in the small cabin/shack in direct view of the "private & secluded" hot tub. We were told this man and his wife actually live in the small building there. This all would have been fine if it had been clearly defined in both the advertisement online & in my email correspondence prior to booking. Instead, I feel jipped and scammed. The inside space itself is really classy and beautiful. However, it was hard to stay warm as the main source of heat were electric heaters that worked inefficiently for the size of the space. The wood burning stove didn't put out much heat once we finally got it going with what little, wet kindling we were given. Since it was raining and the rest of the wood outside was wet we had to make due with what we had. The hot tub was nice while it worked. The second day, it started leaking out water from the bottom of the filter and then shut itself off. The water level dropped quite a bit and was dirty. Luckily, the inside jacuzzi tub is fantastic! The recycling hadn't been taken out from the previous guest and was half full of empty Coors light cans that made the cabinet smelly. Nice big kitchen though. Technically, there's only 1 master suite. Heidi was pleasant at first meeting but soon became brazen with odd behavior. She messaged me several times at regular intervals to "communicate" her "needs". Interesting. I have never encountered a "Reiki Master" to be mean. In the obverse, I found someone who no matter the situation, wether ideal or wanting, would complain if they didn't find everything exact or indeed perfect. The lower level studio is a guest area separate from the main house. It is used for the temporary stay of those in need and for myself on occasions where being on the property is essential. This is temporary and will be amended. The Hot Tub works well when used properly. I detail the importance of only using the "Timed Jets" option and not to adjust the Temp setting. Increasing the temperature puts strain on the heating element and makes it too hot for all guests. Furthermore, there has been consistent snow and rain that reduces the overall enjoyment of the Hot Tub and can cause an overflow of water. This is being addressed with an extra covering and possibly a gazebo. Guests generally enjoy the overall size and amenities of the Lovely Cabin House. The beds are very comfortable and it is clean and accommodating. It is peaceful, quite and has lakes, scenic views and hiking/biking trails nearby. Most guests stay at the Lovely Cabin House and are pleased. Read reviews from other vacation rental companies outside of Home Away and its subsidies. NOTE: I am constantly fine tuning the Deluxe Cabin House as well as the experience and enjoyment of my guests while keeping the price at a minimum. However, prices will increase with greater care of this rare premium place. Thank you and enjoy every moment.... "It comes to this: "Faith, Hope and Love. The greatest of these is Love..."
Cabin was nice. No central air. Rooms were hot. The instructions from the owner were not to park on patio in front of house and not in front of garage. There were 4 of the owners vehicles parked in and around the designated parking area. The cabin is at the bottom of a steep driveway. With two vehicles it was nearly impossible to park or manuever to get out. Also someone whom I assume is the caretaker was in and out of the garage. It was definitely not very private feeling. Most guests who stay at the Cabin House in the TVE are very pleased. Read reviews on other vacation rental sites. There are more positive things about the stay here than negative. Guests should mention them when leaving reviews. They generally enjoy the size and amenities of the cabin house. The beds are very comfortable and it is clean and accommodating. It is peaceful, quite and has lakes, scenic views and hiking and biking trails nearby. This is a place that costs half the price for what you get to comparably priced places. It is well worth a stay....guarantied. First, the good: this is a cute little house in a lovely setting. Seth is a very nice guy and a responsive communicator. It's clear that he's made some efforts to provide his guests with a comfortable stay. Now for the 'not so good': we booked this weekend as a retreat for five women and made that clear in our rental request. At no time were we informed, nor was it stated in the description of the listing, that there are other people living on the property in close proximity to the house. Not only is there a large RV right at the bottom of the driveway (not pictured in the listing) where a "caretaker" lives , there are also several other outbuildings, one clearly occupied by another couple. We did not find this out until we arrived at the house to find other people there...and there was always someone around outside for the duration of our weekend. It felt as though we did not have any privacy (note the lack of solid window coverings in the pictures) and this prevented us from even being able to enjoy the outside spaces on a very beautiful weekend. 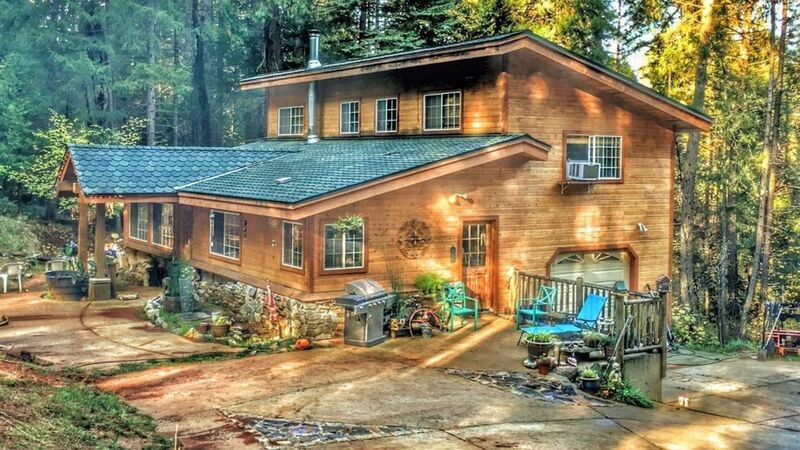 If you are up for a campground-like experience, by all means rent this property - you will have constant neighbors, people smoking, talking early in the morning, and coming and going all day. Nice people...but still people around when the listing makes it seem as though you will have an entire property to yourself. In fairness, people were not right outside the windows looking in, but they were always close by. It's also fair to mention that this is not the cleanest of houses - the toilets were dirty, we had to hand wash most of what we used in the kitchen before we could use it, and the "spa tub" was not inviting. The walk-in shower is a stained cinder block shower with peeling paint, and there are multiple areas of exposed wires in one bedroom where there should be lighting fixtures on the walls. I have rented many VRBO properties and have never had an experience like this one. Hopefully this honest review helps others from being misled as we were. I thought it was fair to ask for a refund for at least one of the nights since Seth admitted he should have let us know about the other people on the property, but so far I have not received a response from him. Next time I will not rent a place that only has one review - I've learned a lesson and hope I've helped other people in making a decision about this rental. We loved our weekend away in this cabin! Seth is a super nice guy and we were glad to stay here. I enjoyed Derek as a quest. He was respectful of the property and is welcome back anytime.